978-ARWE-DST is rated 4.6 out of 5 by 19. Rated 5 out of 5 by Terry D from Leland Faucet Nice and simple! Looks good and works great. Love the spray feature and self-docking feature. Rated 5 out of 5 by Sran from This is a beautiful faucet This is a beautiful faucet; I love the design. The retractable hose works very well and easily sets back into place. The 360 degree turning radius is very smooth, and the switch between spray types is easy to use and conveniently placed. The handle placement for mine is on the right hand side, but I think I may have preferred it on the left since I am right handed so normally hold pots for filling, etc with my right hand. 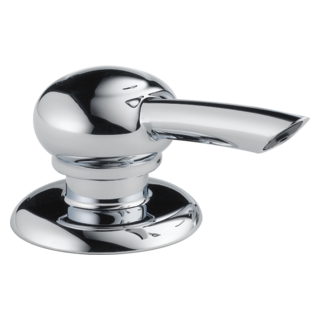 Rated 5 out of 5 by Justice from Good faucet, Customer service was very helpfull. Good Faucet turns on and off. Water comes out spays dishes, sinks and kids when they don't listen. It is easy to keep clean and looking new. Faucet developed a small leak almost like it would not shut all the way off. Called and they walked me through figuring out what faucet it was and the parts needed. Waited a couple weeks and they never showed. Called back and for some reason they never got ordered. The second agent reordered the parts and we are waiting on them now. All the faucets in our house are Delta and I'm getting ready to buy another faucet for our outdoor kitchen. Delta has always been good to me and helped to fix any issue we have ever had. Rated 5 out of 5 by Tiggerroo from Awesome faucet!! We recently updated our kitchen with stainless appliances and wanted a faucet to match. This one has great functionality and beauty to match! Would highly recommend it!! Rated 3 out of 5 by melissa from Looks pretty, nice features, poor handle design Agree about the handle- always wiggling about. There is a plastic part that broke in short order too. Rated 5 out of 5 by Michaeljm from I like the ease of use. Well built The new faucet was easy to install and works perfectly. The artic color is real nice. I have been happy with Delta for many years now. Rated 5 out of 5 by Julie from Looks Great We purchased this when we remodeled our kitchen. Love the function of this faucet and the beautiful bronze finish. Added the soap dispenser and I love all of it. Delta is a great product. Rated 4 out of 5 by Boogsy from Very sleek and stylish I bought this faucet a few months ago and I do love the styling. I find that sometimes when you think the water is off, it is still running or dripping, so you have to be careful and make an extra effort to make sure the lever in push all the way down. Love the finish and this faucet has made a beautiful addition to the kitchen. Which beverage faucet would look best with the Leland faucet 978-dst? What is the difference between the 978-RB-DST, the 9978-RB-DST and the 978-RBWE-DST faucets? Also, can you get this type faucet with the 2.2 GPM wand? Thank you for your questions. 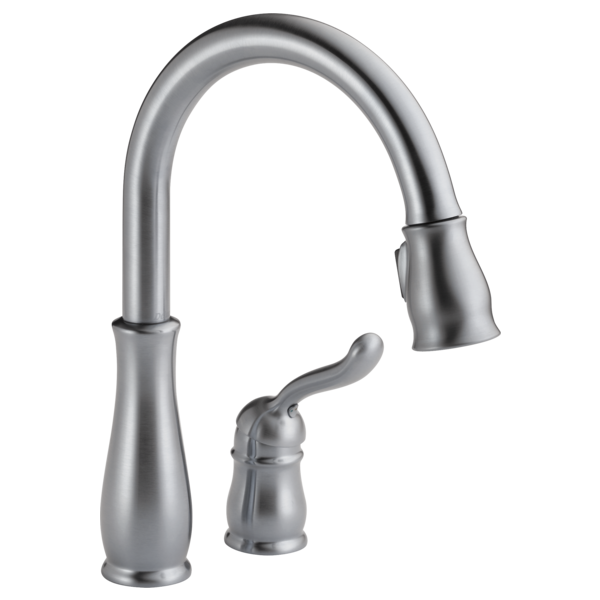 Delta Faucet model # 978-RB-DST is a kitchen faucet that flows at 1.8 gpm at 60 psi. 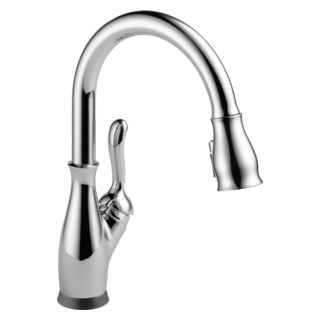 Delta Faucet model # 978-RBWE-DST is the same kitchen faucet as above but it flows at 1.5 gpm at 60 psi. 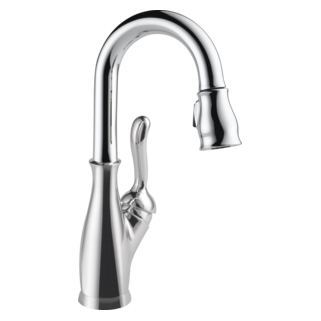 Lastly, Delta Faucet model # 9978-RB-DST is the same faucet as the other two but in a smaller version for a bar/prep faucet. It flows at 1.8 gpm at 60 psi. We do not make a version of this faucet that will flow at 2.2 gpm at 60 psi. HOW HIGH IS TALLEST PART OF FAUCET? Dan, thank you for your question! The highest part of Delta Faucet model #978-WE-DST is 14 1/4&quot;. Does this have to be mounted 4&quot; apart or is 5 or 6&quot; possible? The water flow handle is hard to turn and squeaks, how can I fix this? Possible to &quot;convert&quot; this to regular 1.8gpf faucet? Is it possible to make this faucet operate at 1.8 gpf by simply omitting the RP61607 adapter, or does the aerator itself also need to be changed to 1.8 gpf version? thanks!